Designed for both the amateur or professional. Used in school projects, workshops, professional paint shops, machine shops to spray oil, rust proofing, etc.- any job that requires a simple yet effective spray. 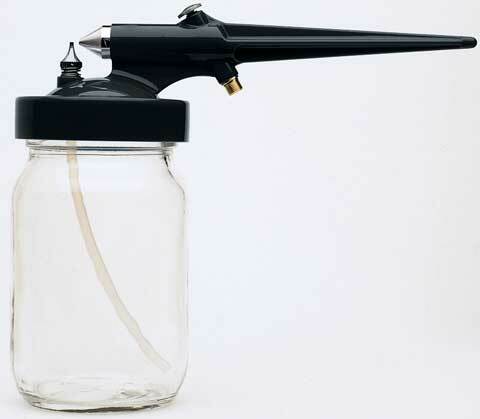 The Model 250 is an easy-to-use, single-action, external mix spray gun. The spray pattern can be adjusted from 3/4" to 2" by turning the paint tip. Because of the larger orifice, this unit will handle heavy viscosity media. Designed for larger overall coverage and not for fine work, the Model 250 will handle the majority of projects- fogging and blending, textures, patterns, etc. Packed as sets. The BA250-2 contains a spray gun with one 3/4 oz. jar attached, Propel regulator, a 6 ft. vinyl hose and instructions. The BA250-3 contains all the items in BA250-2 plus a Propel can and an extra jar.